Lester Bangs. Greil Marcus. Robert Christgau. Pauline Kael. Dave Hickey. Just as cowboy boots have figured into my footwear rotation off and on since I was a kid, critics have been among my writer heroes since long before my first published byline — which was for a book review (of poetry) in some scholarly humanities journal nobody’s heard of. I discovered Bangs, Marcus and Christgau in high school when I was still an over-zealous music snob. Kael I found out about in undergrad, during my Woody Allen/Wim Wenders/Terry Gilliam phase. Heard about Hickey’s seminal Air Guitar essay collection from a friend of a friend when I was living in Chicago, dividing my evenings and weekends between bookstores, Art Institute exhibitions and free jazz and alt-country concerts. I quit reviewing books and CDs for money and promotional merch when I started performing comedy for free several years ago. I’m dumb that way sometimes. Over the years I had lucked into some sweet regular gigs, penning reviews for Publishers Weekly, Rain Taxi, All Music Guide and Blues Revue. And I’d only tried out comedy in the first place to fulfill a magazine assignment. But after a successful-ish open mic or two, I decided the world had had its fill of my pretentious opinions and now deserved to sit quietly through some of my pretentious one-liners. The big problem with my plan, it would turn out, was that I never really stopped having opinions. I only quit publishing them for a decade or so. Did you miss me? Did anybody even notice I was gone? Probably not, according to my mother. Which is why I live up here in Minnesota, not down in Indiana near my family. I like to think my Hoosier roots help explain my recent purchase of cowboy boots, at least a little. 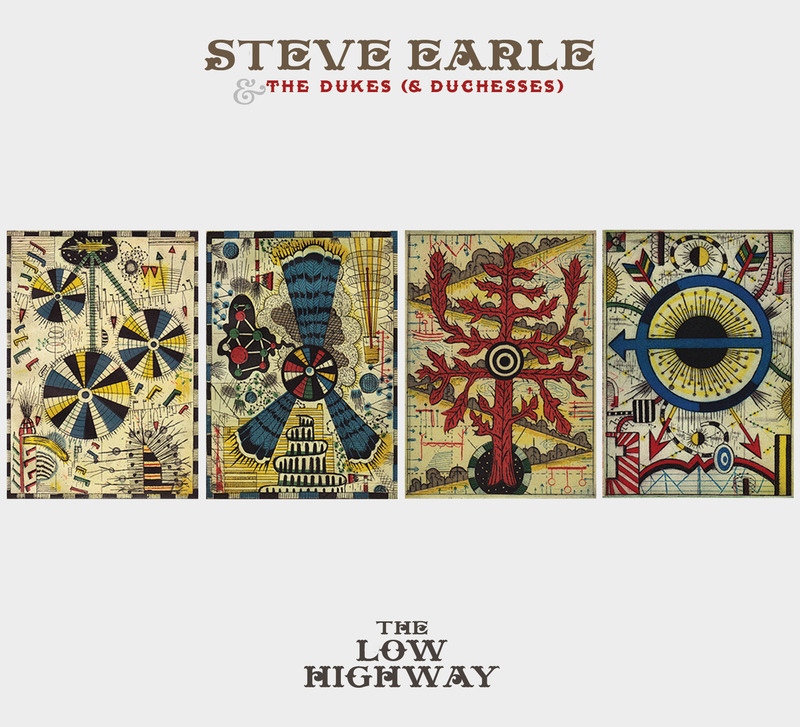 Steve Earle’s new album, The Low Highway, might have something to do with my new boots, too. That, and the FX TV serial Justified. And the Minnesota poet Robert Bly, too, while I’m playing the blame game. My graying 22-year-old beard doesn’t characterize me as a man the way it used to. Whenever I see hipster dudes younger than my beard walking around with their chin stubble all grown out, I find myself wondering if my facial hair is an ironic statement or a sign of authentic laziness in the grooming department. I always hope that it’s the latter. I’m so, so tired of irony — or, at least, I like to think I am. After all, lately I’ve been listening to country music from a Texas troubadour now based in New York City, loving a television drama that barely distinguishes between hill country crime and justice, and revisiting Bly’s Jungian examination of where myth and manhood meet. 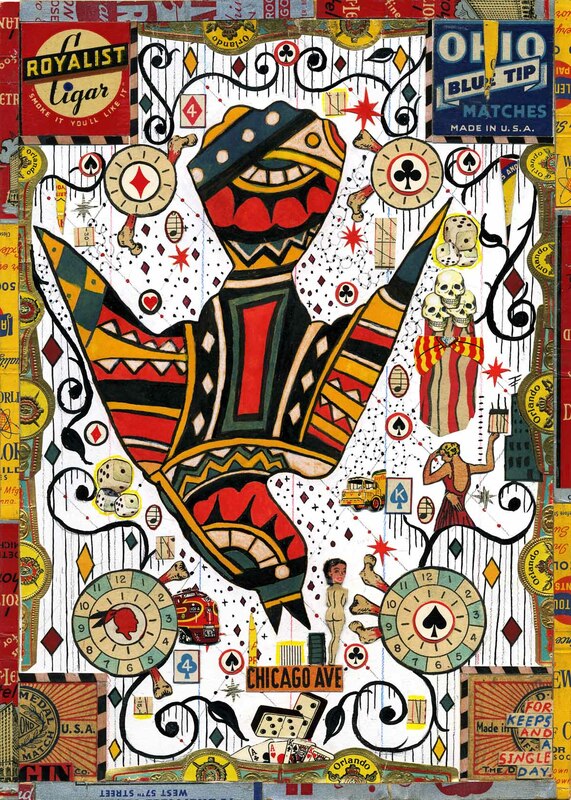 There is one thing I can tell you with some certainty: I’ve determined that Tony Fitzpatrick, the self-taught Chicago artist/writer/actor/man whose works grace many of Earle’s album and book covers, is my favorite working visual artist at the moment. Show posters and prints of his work hang throughout my house. (His drawing Dirty Dove is in the permanent collection at the Minneapolis Institute of Arts.) The four Fitzpatrick pieces that adorn the cover and insert booklet for The Low Highway I’ve loved since I first saw them in the pages of This Train, Fitzpatrick’s incredible 2010 book of collages and corresponding journal entries inspired by the hobo alphabet, the legend of Crazy Horse and the poetry and politics of what it takes to live in Chicago these days. Which is what it takes to live anywhere in America, I’m afraid. Like a hobo passing back through a town he’s visited before but skipped in a bit of a hurry, I have more questions than answers. Especially about what I’ll notice and make note of here every couple of weeks. There will be a lot less about me, for starters — and more, for sure, about Minnesota arts. You have my word as a man. Whatever that means. Brian Beatty’s writing has appeared in numerous print and online publications. His column of one-liners, “Jokes by Brian Beatty,” originated at McSweeney’s Internet Tendency and wound up in the gutters of the front spreads of METRO Magazine, which also once rated him among the funniest people in the Twin Cities. In addition to penning “The Columnest” twice each month, Brian hosts mnartists.org’s monthly literary podcast, You Are Hear.